Rawhide Rattles. Based on a Native American design. These rattles are made from English Red, Roe deer or Sika Deer (which we tan ourselves), and occasionally from Horsehide or Scottish Red Deer. They are hand sewn with hemp thread and filled with seeds. The handles are from native hardwoods, usually hazel but occasionally birch, holly or oak. Price and ordering: Rawhide Rattles are usually priced from £20 to £35 depending on size and material, plus shipping. Check out our Etsy shop to see if we have any in stock. If there are none in stock contact us and we will notify you when one becomes available. Horn Rattles. Based on a Native American design. These are sometimes known as Steer Horn rattles. These rattles are made from polished cow horn, the wooden ends usually from cedar or maple and filled with seeds. The handles are from native hardwoods, usually hazel but occasionally birch, holly or oak. Available as large, medium or small. The rattle pictured below right is a large rattle. Price and ordering: Horn Rattles are usually priced from £20 to £35 depending on size and finish, plus shipping. Check out our Etsy shop to see if we have any Bullroarers in stock. If there are none in stock contact us and we will notify you when one becomes available. Deerskin Shaman Drums/ Frame Drums. The drums of ancient Europe are something of a mystery. There are words for drum in Anglo Saxon and Old Norse, but no illustrations or instruments have been found. The Viking's neighbours the Saami (or Lapps) have a long tradition of Frame Drums, which are mentioned in Old Norse literature, and so our historical drums are based on Saami, Siberian and Native American examples. 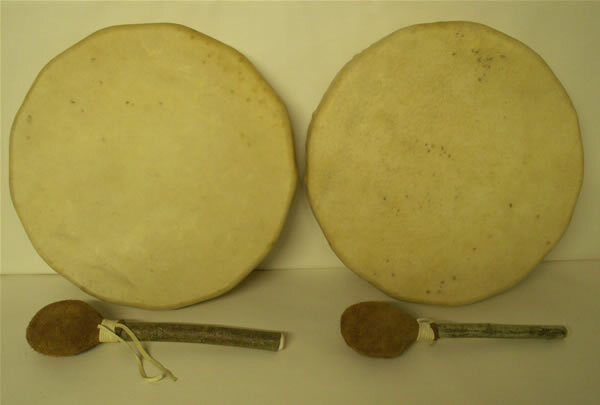 These types of drum have become popular among Shamanic Practitioners, and so are often called Shaman Drums. The natural skin head is susceptable to changes in humidity, and thus can betuned to a limited degree by dampening to slacken the head and warming in the sun or (slowly) by a fire to tighten it. The drum may have to be warmed up before playing on a damp day. The skins are from Finnish Reindeer, American Horsehide, Scottish Red Deer or from local Roe, Sika or Red deer which we have tanned ourselves. The lacing is always done in one continuous piece for the best possible sound quality and a very beautiful appearence. 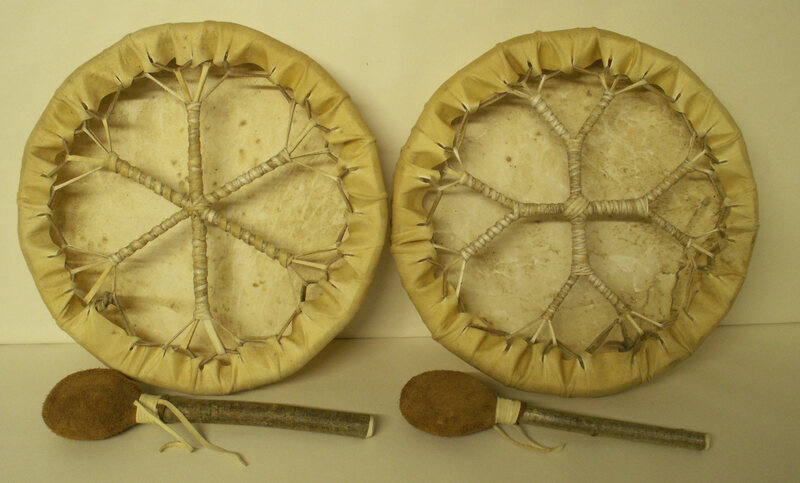 The lacing is itself made of the same rawhide as the drum head except for the circle of lacing on the large drums where a stronger rawhide is sometimes used for strength. No artificial sinew or other man made products are present in the drum. We like the lacing to be on display, but if you would like the lacing wrapped in suede buckskin for comfort let us know. The hoops are steam bent solid wood, not plywood or other laminates. Occasionally multi piece polygonal solid softwood hoops are used, where this is the case they are tenoned as well as glued for strength. Price and ordering: Drums are usually priced from £110 to £200 depending on size, material and decoration, plus shipping. Check out our Etsy shop to see if we have any in stock. If there are none in stock contact us and we will notify you when one becomes available.